New York City should have been destroyed 33 years ago. A bunch of really smart people got together in 1880 to predict the future, according to Jeff Stibel in his intriguing book Breakpoint. These experts were called on to predict how the rapidly growing Gotham would manage into the next century and beyond. The prognosis was not positive. 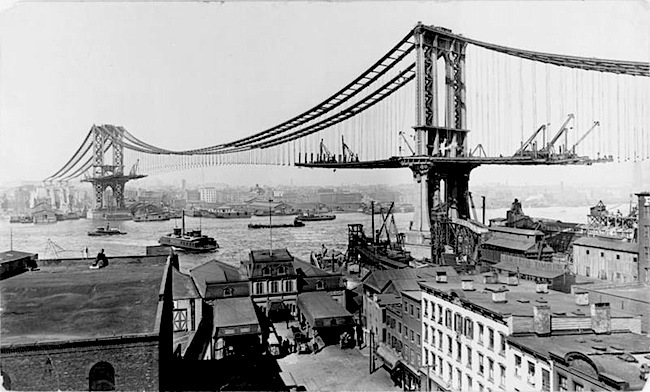 NYC was a major source of American innovation in 1880. Skyscrapers, subways, stock exchanges — and it was doubling in size every 10 years. The experts were concerned by this growth, because they projected by 1980, you’d need six million horses to transport all the people who would live there. Six million horses. That’s a lot of literal crap, and that’s why New York City was doomed. The horse exhaust was more of a concern than greenhouse gasses at the time. Things obviously turned out differently. But in all fairness, how could those smart people have known how — and to what extent — technological change would occur? The most frequent question I’ve gotten lately is “What’s the future of content marketing?” I generally refuse to answer for reasons that should be clear from the story above. On the other hand, the true answer is even less satisfying to those with shiny object syndrome. Fundamentally, nothing will change. The technology will change, but the primary tenets of content marketing will not. Technology doesn’t change human nature, although it may amplify it. People have problems and desires. They want information that helps them with those problems and desires. That will never change. Consumption methods will certainly change. What will wearable computing mean for content? No one knows for sure, and anyone who says they know is not someone you should trust at this point. So, in the near term, we know that mobile responsive design has quickly gone from cutting edge to must have. We know that HTML5 will allow us to make web pages do things they’ve never been able to do before. We know that brands and individuals who embrace quality media production win at the new game of business. But if you don’t have the fundamentals down? Don’t even think about what’s next. Do the now better than anyone else in your industry. That’s the beginning of your particular future. Previous article: Can You Pass This Content Marketing Test? Nice move on changing your Twitter to corporate. Makes sense. I reckon this one runs parallel with your piece on thought-leadership (which also made a lot of sense). Over the last two years, I’ve seen plenty of people at my (low) level of content marketing experience trying to get ahead of the game. Not enough of them run into your showstopping content in time. …no need to do so on G+. That crowd already gets it. Boss words as always Mr Clark. I think ANY kind of marketing works, not because there is something special in the marketing itself, but because it is designed to appeals to basic human emotions and emotional triggers. The tools will continue to evolve but the basics will probably remain the same unless the human software evolves. Couldn’t agree with you more. Think how much technology has changed in the last ten years. I certainly couldn’t have foreseen where we have ended up. But here we are, nonetheless, and although the tools may be different our driving motivations and actions remain the same as they always were. Brian, I concur with your points. ”We know that brands and individuals who embrace quality media production win at the new game of business. But if you don’t have the fundamentals down? Just a few decades ago, we thought that flying cars and jet packs were the wave of the future. Before that, it was automated robots that would do our dishes and sweep our floors. There’s no telling what’s coming next – so concentrate on what’s here NOW and get that down properly, then it will be much easier to adapt when the changes do come. love the rapid growth of NYC parallel. experts could never have wrapped their brains around today’s transportation technology in the same way we can’t begin to imagine mediums of media 100 years from now. I’m happy to hear that content marketing will not go away. This bodes well for the digital analytics field and the analysts within it. If new content will always be needed, there should always be a job for a digital analyst—a job analyzing user-journeys through all that content and the level of engagement by users. And of course, a job tying back revenue to all that content. I’m just a lowly real estate agent selling beautiful houses on Cape Cod. But, I am a total believer in Inbound, Content Marketing. From a real estate point of view the best result you can get from inbound marketing is to have a buyer look at all the info on the web site I create for one of my listings, call me, and make and SIGN an offer without EVER SEEING THE HOUSE. This has happened to me twice. More to the point of this article, I see a major change (addition) coming to the real estate market and probably other type of products too. And the world is not really ready for this change. It is the opposite of the mobile revolution — which the world has mostly come to grips with. I’m speaking of the BIG SCREEN Network TV revolution. Yes, people will still watch real estate videos in their cars on an smart phone. But they will also start watching these videos at home, as a family, on the 70 inch flat screens. You can do this today with a smart TV and YouTube. But, the video quality is NOT there and the movie quality is not their. In one of my recent blog post videos I told this story through the eyes of that ultimate consumer — Goldilocks. She was not a girl to settle — wanted everything JUST RIGHT for her. I agree… It does not really matter as long as you provide a solution to a problem.. I think “moble” marketing is getting a good buzz right now though.. I am a very, very visual kind of person. When someone tells me a story, I automatically see a visual image of the story. Imagine my delight to see so many horses dropping their steaming, hot pancakes all over The Big Apple. Nicely done. Serve, connect, adapt(at least most of the time). Awesome message! Adapt. This is where the 6 million horses thing comes into place. Note trends. Flow with them….except….when you should not. Going against the grain can prove to be the most prospering thing going. No need to become a dinosaur of course but if you can adapt but differentiate yourself from the herd, and brand yourself as THE authority in your niche, you will have stunning success in your niche. The adapting thing can be tricky but if you create and connect, you should be golden no matter what because you can spot general trends that would be wise to follow, from your buddies, and you will also rise above the field of competition by creating persistently. Thanks for the post. The base of your message, that the fundamentals will never change, is a great one to pass on. You’re right, the foundation of content marketing won’t change unless the desires of the consumer changes, which is unlikely because everyone wants valuable information. I definitely agree, content marketing is always changing and it’s best to be open to those changes. “Do the now better” I like that! I received some interesting feedback from the General Manager of a company I write for recently. I’ve been writing for them for 3 years now and watched them go from strength to strength by doing everything right – article marketing being just one of their strategies. Anyway, he said that aside from articles generating sales, they also help him get new advertisers on his site (it’s a home improvement site). They like what they read and sign on. I always focus on the customer when I write. It’s interesting to discover that good content can have side benefits as well. I couldn’t agree with you more on this Brian. It’s exactly the same way as marketing has not changed one bit people are still the same but the medium is changing. The same thing that works on a billboard will work on a banner ad or a FB post. There are more opportunities for us to create our own adverts now then ever before but the fundamentals are and always will be the same. Predicting the future is pointless in many ways, the most important thing is to understand what works and why and start applying it to your venture. Thanks for the interesting read, it was beautifully written. Thank you! The example of how New York should be destroyed at this point is amazing. Content are words that we record for history to read. With that being said, I thought this was a great article pointing out the future of content marketing. That’s a great line, and one we’ve adopted within our company and the commitment to investment in our premises, machinery and key people. We also want to further innovate in our approach to content and social channel marketing. Just a further sub note, the true and original meaning of ‘decimate’ does not mean to destroy, it actually means to ‘reduce by one tenth’. Good catch on decimate. Ironically, I originally had destroyed. I think the critical thing here is the tenets of content are the same, but the delivery mechanisms change. Of course, you shouldn’t copy exactly what you across different mediums: Twitter is good to be succinct, Google+ is good for pictures. But if the content isn’t compelling, no distribution innovation is going to change it. Agree! Mobile marketing is future.. And we have to adopt to it. Seems to me that marketing in general really hasn’t changed much. Different mediums usually get treated with the same principles just with slight tweaks. Advertising and marketing are about capturing peoples’ attention and getting them to react in a desired manner. It doesnt matter how you go about it content matters and so does the message regardless of the medium. Impossible to know what the future holds for content marketing, agreed. Do you think that wearable technologies like Google Glass will have more of an affect on how marketing is received or on how it is created? Or even both? I could see a change being a shift towards “more” in general since people will essentially live on wearables and always be able to create or interact with messaging on those platforms, but then again, who the hell knows? I strongly agree that content marketing will never go away, because it is tied to human emotion. We have always been drawn to storytelling, and content marketing done right tells a story. While we may have to adapt to new technologies to share our content, we will always be sharing it. We, as humans, are innately curious and drawn to new information. While we may not know the exact future of content marketing, we should continue to find new, innovative ways to share content. By doing so, content marketing will continue to thrive, just like New York City has. Insightful article! Given the popularity of smartphones, it makes sense that companies trying to stay in touch with consumers are shifting to a more mobile social media marketing strategy. It also makes sense that people who access the Internet from a mobile device are more likely to share social media marketing than those who use desktops and are more likely to visit social media sites several times a day than those who use desktops, because they can be engaged from anywhere. It makes sense for businesses to target the users most likely to see their ad multiple times and to share it with others. On the other hand, desktop shouldn’t be neglected, because they’re generally giving more focused time and attention rather than glancing at a page while waiting in line at Starbucks. I totally support your point, Brian! Idea of content marketing will never change! It could transform to different form, it could use different types of sources, but the base will stay the same. In this case the only thing a successful marketer can do is stay professional, and loyal to the business he or she is involved to. I love this post, Brian, thanks so much for sharing. We see the same issue in customer support: everyone wants to know what the next big channel for support is. That’s the wrong question. Instead, companies have to ask “how can I become better at making my customers happy?”, not “what medium will my customers use to ask for help in the future?”. So many parallels in nearly every industry.